Big Brother announcement, baby announcement, sibling announcement, dinosaur bracelet, dino bracelet, big brother bracelet. Comes with card. Wooden and glow in the dark beads. You may also check our facebook page for previous orders we have done. Big Brother bracelet, big brother gift, big brother announcement, free card. Dinosaur necklace bracelet set, childrens jewelry, beaded jewelry set, kids jewelry set, dinosaur necklace, dinosaur bracelet. 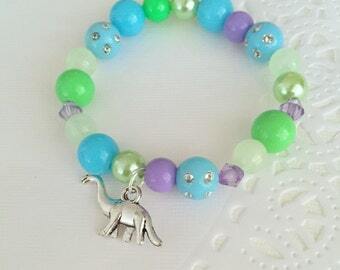 Dinosaur, beaded bracelet, kids birthday party, dinosaur party. SET of TEN. Glow in the dark, children birthday party favor, wooden beads, customized, initial bracelet. Free personalized notecard and organza bags. Dinosaur necklace, dino jewelry, kids animal necklace, kids dinosaur necklace, dinosaur jewelry, childrens jewelry. Set of FIVE, Dinosaur necklace, dinosaur jewelry, kids animal necklace, dino necklace, dino jewelry, dinosaur party favor. Big Sister bracelet, big sister announcement, kids bracelet, sister accessories, sister announcement, pink bracelet. 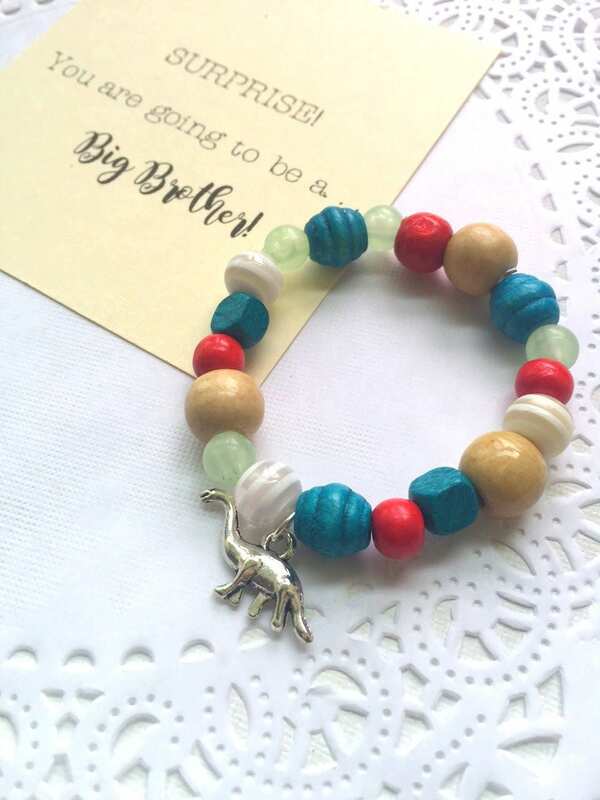 Big Sister bracelet, big sister jewelry, big sister jewellery, rainbow bracelet, rainbow jewelry, Comes with Fun card. Pastel bracelet, name bracelet, personalized bracelet, ONE bracelet, unique name bracelet, kids jewelry, kids bracelet, birthday party gift. Beautiful! Our daughter loves them. Will be perfect party favors. Thank you! SET of TEN. Starfish bracelet, Mermaid party, jewelry favor, kids, stretchy, bracelet, ocean inspired, aqua, turquoise. Big Sister bracelet, big sister jewelry, mismatched beads, big sister jewellery, rainbow bracelet, rainbow jewelry, Comes with Fun card. 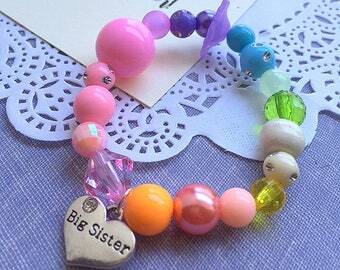 Pastel Big Sister bracelet, big sister jewelry, mismatched beads, big sister jewellery, rainbow bracelet. Comes with Fun card. Set of THREE, Big sister bracelet, Middle Sister bracelet, Little sister bracelet, sibling bracelet, sibling jewelry, sister announcement. 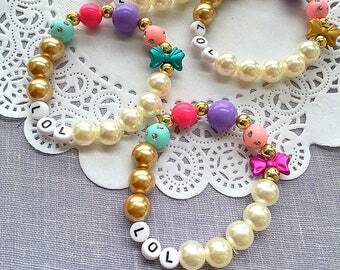 LOL birthday party, kids birthday party, birthday party favor, beaded bracelet, SET of TEN. Ask Godmother, locket necklace, secret announcement. FREE personalized notecard, jewelry box. Dinosaur keychain, SET of FIVE. dinosaur birthday party, dinosaur party favor, backpack clip, dino keychain, dinosaur clip. Pregnancy announcement keychain, grandparents, surprise, handstamped, birthstone charm KEYCHAIN. Comes with FREE personalized notecard.